As part of the 2015 Design Canberra festival, Landscape Architect Harris Hobbs Landscapes undertook a public consultation process which resulted in some very interesting and useful ideas for addressing some of the safety and design deficiencies on Red Hill Drive and the summit parking area. Download their plan here (21Mb). While this is at the ‘ideas’ stage and has no government funding or support, the Regenerators hope that all this effort is not wasted. 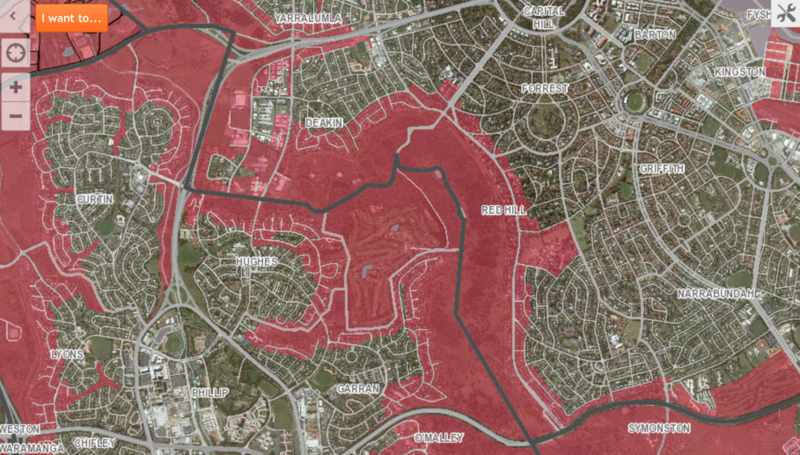 The latest ACT Government map showing the most bushfire prone areas in Canberra, shows that the location of the proposed housing development at the Federal Golf Club lies squarely within an identified ‘bushfire prone’ zone. The single risk-based map defines the area of the ACT that has been assessed as being at high risk to life and property due to bushfires. Download the interactive ACT map from here. Click on the image below to download and enlarge. 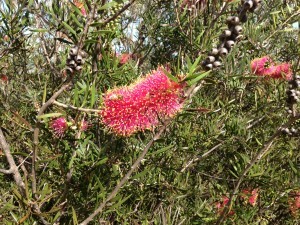 Now is the time to view the heritage callistemon citrinus plantation just below the summit cafe. All the clearing work undertaken this year has paid off and the showy red flowers are looking magnificent. Note that the flowers on the south side of the downhill path are a paler pink than those on the north side. There is no record that two subspecies were planted here in 1917, but it looks like it. In a meeting on 1 October 2015, attended by 37 members of the Club, the extent of the proposed development on the golf course concessional lease, was made clear for the first time. It was stated that 70 – 80 villas would be constructed in the area ‘above the 14th hole’, and a further 40 dwellings on the ‘clubhouse site’. this was contradicted by a statement that 120 – 150 dwellings would be constructed. 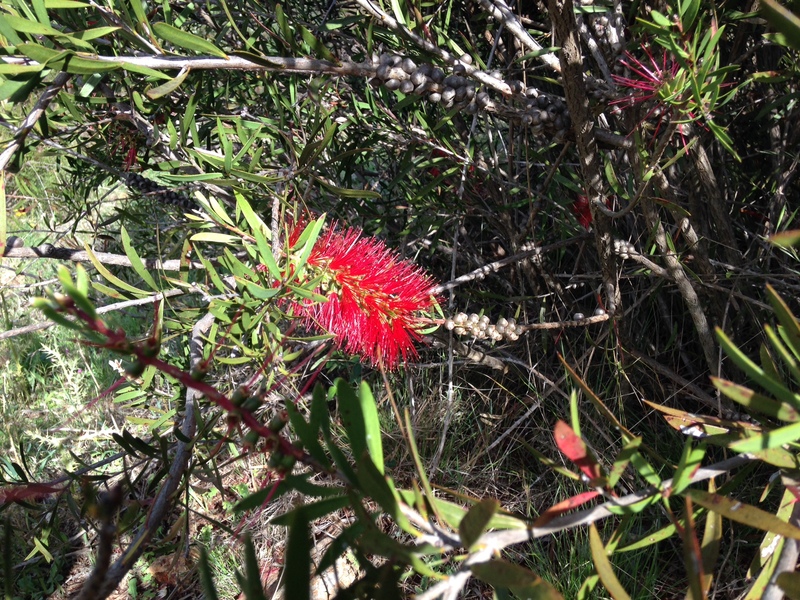 it is noted that this latest proposal now has more than double the number of dwellings occupying the sensitive remnant Red Gum/Yellow Box woodland adjacent to the Red Hill Nature Reserve. It is clear that virtually all trees would need to be removed in this area to accommodate these dwellings. The meeting also confirmed for the first time that developer MBark has now been signed up to manage the development. A specimen of the Boulanger’s skink (Morethia boulengeri) has recently been sighted on Red Hill. For more information and photograph go to the Canberra Nature Map here. We are consulting with the authorities regarding an Optus proposal to trench a fibre optic cable along the summit road to the Optus tower located near the lookout. We will continue to consult and monitor the work to ensure that disruption to the nature reserve is minimised. Further exploratory work has recently been completed in the area of the old tip site close to the old Telecom building. Advice is that the work being undertaken is monitoring of the tip site, including mapping the depth of the capping, air and gas monitoring etc. The President, Secretary and Treasurer of the Red Hill Regenerators met on 19 October 2015 with members of the Federal Golf Club Board and property developer MBark Realty P/L to discuss their development proposals. The Club and developers confirmed that their proposal is similar to that put forward earlier this year, and that it would require about 120 dwellings to achieve financial viability. No plans are available at this time as the proposal was described as being in an early ‘community and stakeholder consultation’ phase. The Regenerators representatives outlined their broad objections to developments of this type and followed up the meeting with a letter on 26 October 2015 documenting these matters. This letter was also mailed to MBark Realty P/L on 16 November 2015. More..